Fred Hoiberg was introduced this morning as the new head coach of the Cyclone men’s basketball team. 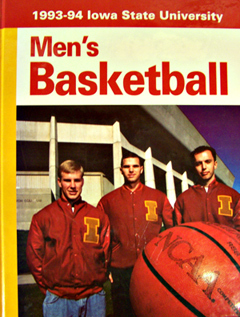 Hoiberg called Cyclone enthusiasts the “greatest fans on the planet” and Hoiberg said he wants to bring “Hilton Magic” back, a reference to the raucous atmosphere of the Cyclone’s home court in Hilton Colesium which was a sold-out arena during Hoiberg’s years as a Cyclone. Jamie Pollard, Iowa State University’s director of athletics, said Hoiberg contacted him four years ago about the head coaching slot , but the time wasn’t right. The job went to then U.N.I. coach Greg McDermott. McDermott left I.S.U. to take the job at Creighton. Pollard said Hoiberg had learned from some of the “best coaches out there” including Larry Brown, Larry Bird, Flip Saunders, Kevin McCale, Tim Floyd and Johnny Orr. “He convinced me that although he hasn’t coached officially, he has coached because he’s learned what great leadership is all about,” Pollard said. Pollard announced Hoiberg is retaining the team’s lead recruiter, T.J. Otzelberger. In addition, Hoiberg will keep Jeff Grayer, another I.S.U. star of the past, on staff as an assistant as a “role model” for the players according to Pollard.